Does CoQ10 Reduce Blood Pressure? Coenzyme Q10, or CoQ10, is a fat-soluble substance that is made by the body that cells use to produce energy, as well as provide antioxidant power. Although CoQ10 is made in the body and found in many dietary sources, a coenzyme Q10 deficiency can occur. According to the "Cochrane Database of Systematic Reviews," coenzyme Q10 deficiency is often associated with cardiovascular conditions such as heart attacks, strokes, high cholesterol and high blood pressure. Using CoQ10 as a supplement may help prevent these cardiovascular issues. Coenzyme Q10 is primarily found in the mitochondria, which is responsible for converting energy into forms that the body's cells can utilize. CoQ10's main function is to help synthesize adenosine triphosphate, or ATP, a nucleotide necessary for many biological activities including the production of protein and muscle contraction. CoQ10 also acts as an antioxidant, helping the body neutralize free radicals, compounds that may be responsible for hastening the aging process, and contributing to the onset of major health conditions such as cancer and cardiovascular disease. Coenzyme Q10, although it is produced in the body, can be found in food including oily fish such as tuna, herring, and salmon, organ meats such as liver, peanuts and some fruits and vegetables. CoQ10 can also be found as a dietary supplement, in the form of soft gel capsules, hard shell capsules, tablets and oral spray. Coenzyme Q10 is often used as a supplement to help lower blood pressure, but according to the University of Maryland Medical Center, it may take up to 4 to 12 weeks before any positive effects may be seen. The studies that have been done were small but appear to be promising. In the April 2007 issue of the "Journal of Human Hypertension," researchers concluded that coenzyme Q10 has the potential to lower blood pressure without any major side effects. According to the clinical trials the researchers analyzed, coenzyme Q10 has the potential to lower systolic blood pressure by up to 17 mm Hg and the diastolic blood pressure up to 10 mm Hg. 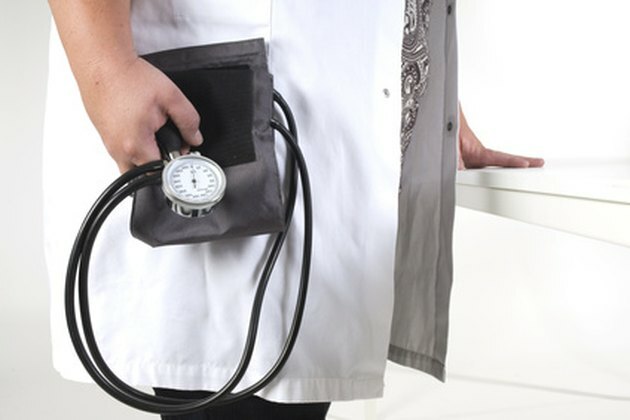 In a study published in the October 2009 issue of the "Cochrane Database of Systematic Reviews," clinicians found that the participants who had a systolic blood pressure higher than 140 mm Hg or had a diastolic blood pressure higher than 90 mm Hg and used coenzyme Q10 did see a decrease in their systolic blood pressure by 11 mm Hg and their diastolic blood pressure by 7 mm Hg compared to those who used the placebo. However, the trials were too small to be conclusive. Larger studies should be established to prove that CoQ10 can reduce hypertension. Using coenzyme Q10 appears to be safe; however, with any supplement, it is important to consult a physician before using. Side effects associated with CoQ10 are minor but may include abdominal discomfort, nausea, diarrhea, heartburn and appetite suppression. These side effects are usually temporary and can be minimized by dividing CoQ10 into two or three doses rather than taking it all at once. Pregnant or breastfeeding women should avoid using coenzyme Q10 supplements, as well as those who are using prescription medication, especially chemotherapy drugs, blood pressure and blood-thinning medications.